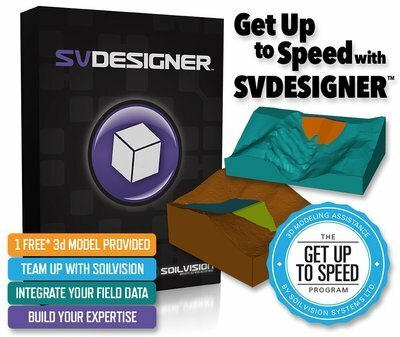 Announcing our Get Up to Speed with SVDESIGNER™ program. We are offering this program on a first come - first serve basis to all new and pre-existing customers. SVDESIGNER™ offers an amazing set of intuitive and powerful features to help you conceptualize your geotechnical designs. To help you get to the end goal faster, we are offering free model development services* with your initial purchase of SVDESIGNER™. Receive one (1) free 3D conceptual model created by our in-house modeling experts using your project data! Have you already purchased SVDESIGNER? You are still eligible to take advantage of this offer! Contact us to find out how.